After a tragedy, folks often gather to help out those who have suffered, any way they can. At one time, we probably would bake casseroles for each other and plan a church service. Today, one of the things that I've noticed happening is that folks set up a Go Fund Me account to help cover medical or funeral expenses. These accounts often raise funds for the victims and may be helpful. However, I am concerned that sometimes they may not be as effective as other ways to help the victim or their families. In fact, in some situations, the accounts may cause further harm to the family. Last month I had the pleasure of attending two different events related to my work in restorative justice. This post will address the opportunity to meet with a group in Harrisonburg. On the 24th I traveled to Harrisonburg the Zehr Institute of Restorative Justice, part of Eastern Mennonite University to participate in a workshop with Howard Zehr and Lorraine Stutzman Amstutz. The Institute hosted a group of judges, social workers, and attorneys from Brazil who are working to bring restorative justice into their schools and judicial systems. During their time at EMU, they had the opportunity to visit the Harrisonburg City Schools and the Harrisonburg Police Department and Prince George’s County where they could see RJ in action. The participants engaged with area experts during meetings and panel discussions on topics such as Restorative Justice and Community Building with EMU faculty Kathy Evans and Carl Stauffer. Howard describes the principles of restorative justice to the participants from Brazil. We joined the participants on their second full day in Virginia, charged with discussing some challenging topics about Restorative Justice and the law. We started the morning with Howard’s presentation about the principles and values of restorative justice. Lorraine then addressed two particular issues: restorative justice in crimes of severe violence and restorative justice and domestic violence. This presentation gave me the opportunity to discuss another difficult question ( but one of my favorites): how can lawyers practice law consistent with restorative justice, with or without a program? This is the subject of my day-to-day work. I’ve also nearly completed the manuscript of Outcome Blind, my book exploring the topic of bringing restorative justice into the everyday practice of law. We can look at this complex, yet fundamental, question by starting with the principles and values of restorative justice. Any activity, whether it be a meeting with a client, a mediation, or a sentencing hearing, may be evaluated against those principles. Each practice can be placed on a continuum, with those that are most restorative at one end (such as a well-run victim-offender dialog) and least restorative at the other (for example, an adversarial trial where the stakeholders are not permitted to participate in the proceeding.) With this type of inquiry, any lawyer, in any place. can find ways to make any process more inclusive, more collaborative and focused on meeting needs. Certainly, a highlight of the morning was a beautiful gift from Jurema Carolina Gomez, representing Tribunal de Justica Restaurative. 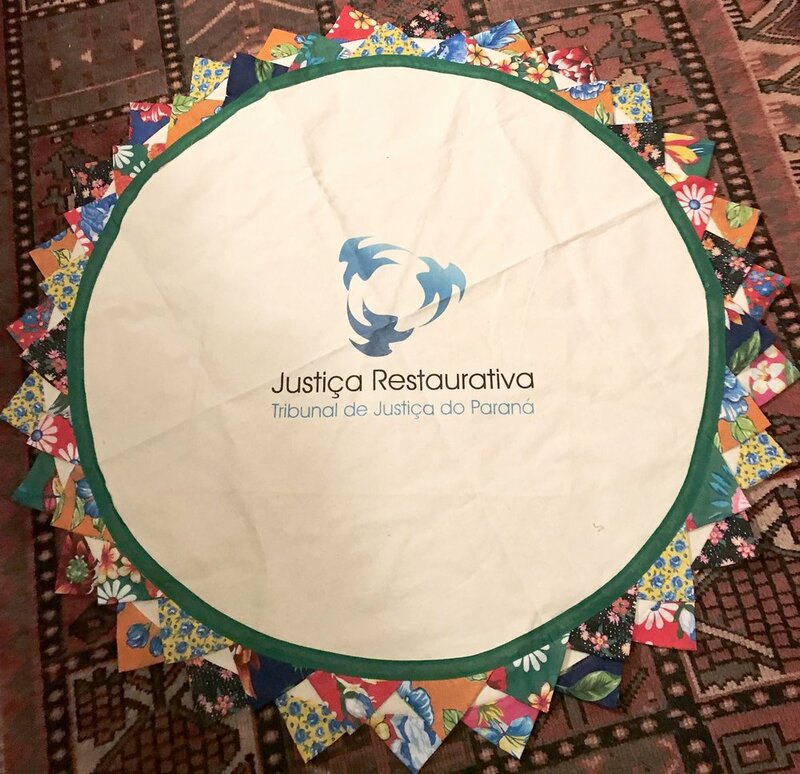 The handcrafted circle cloth includes their signature, a design depicting restorative justice in the center. The judges, lawyers, prosecutors, professors and community members participating in the program, brought a great deal of wisdom, experience, and enthusiasm to the discussion. Judge Leoberto Brancher is a juvenile court judge who has brought restorative justice into his courtroom and launched RJ based programs, through educational opportunities, throughout Brazil. A retired judge, Isabel Lima, was instrumental in bringing the group to EMU, began using RJ in her courtroom in the 1990’s after being approached at a conference in New Zealand by a participant who asked how she was incorporating restorative justice in the classroom. She continued to work in RJ and help draft the first statutory provisions about restorative justice in Brazil. Judge Lima visited EMU last spring, and that trip lead to the development of the fall program that I was able to join. I am always excited to be in a room with folks who are as dedicated as I am to working for justice and peace. This morning was no exception. I found the morning particularly invigorating, witnessing the enthusiasm and creativity of the guests from Brazil who are working to find ways to bring the healing that comes with restorative justice to their communities. In today's blog post, I am going to address some questions I'm often asked about insurance companies and whether or not they have to treat policy holders or injured folks fairly. While the laws in West Virginia have changed in the last ten years (cutting back on the protections that injured people have) most of the time insurance companies must treat consumers fairly. What can be done when an insurance company is treating a claim unfairly? Anytime someone is potentially benefiting from an insurance policy, whether it be life, accident, home or auto, that person should be treated fairly. However, that does not always happen. Sometimes insurance companies decide to make it difficult for a claim to be processed or for the injured person to recover. In that situation, the insurance company is often acting in "bad faith." Sometimes, that can result in further litigation. In other circumstances, a complaint can be filed with the insurance commissioner. It is always best to speak with a lawyer if you believe that you are not being treated fairly. When I first started in private practice in the late 1990's, one of kinds of cases that I filed a number of complaints in were cases involving "insurance bad faith." While that is not as common today as it was then (for reasons I'll describe in a bit) it is still a cause of action, or the basis for a lawsuit. When a person is a beneficiary of an insurance policy that he or she purchased to cover an injury, the laws in most jurisdictions require that when that person files a claim with the insurance company, the company has the duty to process the claim in good faith. This generally requires that the insurance company responds in a timely fashion to communications and that the insurance company makes reasonable offers to settle claims. In West Virginia, there are very specific things that the insurance company must do that are established by statute and regulation. You can find those regulations here: . There are also certain duties that are implied in the insurance contract that can be enforced against the insurance company. What are some of the things that the regulation require that insurance companies do? the insurance company must provide the claimant with penitent policy provisions. the insurance company has to acknowledge the receipt of a claim within fifteen days. the insurance company has to provide the claimant with forms when they want to make a claim. if the insurance company is going to require a specific form, in most situations, they must provide the form required within 15 days. in most situations, the insurance company has to deny the claim or make a written offer within 10 days of completing the investigation. So what does this regulation mean to you? If it is YOUR insurance company, you may have a cause of action or a suit against the company and/or a complaint with the insurance commissioner. In many cases, you may receive additional amounts as damages for their failure to comply with the requirements of treating your fair. If it is the OTHER person's insurance company, you may file a complaint with the insurance commissioner. You may also be able to pursue a bad faith claim against your insurance company. What does first party bad faith and third party bad faith mean? If the bad faith action is by your own insurance company, that is first party bad faith. In that circumstance, West Virginia law supports a claim for you to file suit against the insurance company. Unfortunately, in 2005, the West Virginia legislature enacted new laws that make it nearly impossible for you to file suit in "third party bad faith" or when another persons’ insurance company is treating you unfairly. When you are dealing with an insurance company, set up a file and keep all of your notes, letters and records. If you have questions about whether or not you are treated fairly, call me, email me or come by the office so that we can discuss your situation and determine what can be done for you to receive what you are due from the insurance company. The NLADA recently produced a webinar on new child support regulations most of which go into effect this month. The new regulations require that the states make changes in their policies and procedures to improve the processes states use to collect and distribute child support. They direct a few issues about child support collection that have created problems for some parents. The states are required to make changes in their guidelines that address incarceration and unemployment among other issues.